It’s the 6th Annual NAMI Davidson Walk, 5K & Village,a wellness festival of fellowship and hope swaddled in good music and happy vibes. Engagement is everywhere, at all levels. 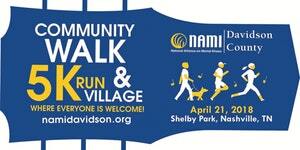 Questions are welcome and can be directed to info@namidavidson.org or via phone to 615.891.4724. Staff and lead volunteers spend lots of time in the community so please be sure to leave a voicemail if your call is not immediately answered. Get more information by going to NAMIDavidson.org.